The 1988 United States presidential election in Louisiana took place on November 8, 1988, as part of the 1988 United States presidential election. Voters chose ten representatives, or electors to the Electoral College, who voted for president and vice president. 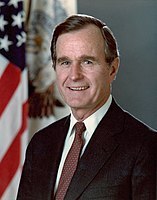 Louisiana strongly voted for the Republican nominee, Vice President George H. W. Bush, over the Democratic nominee, Massachusetts governor Michael Dukakis. The margin was ten percent, which was nonetheless the best Southern state showing for Dukakis. As of the 2016 presidential election[update], this is the last election in which Tensas Parish voted for a Republican presidential candidate. ^ "1988 Presidential General Election Results – Louisiana". Dave Leip’s U.S. Election Atlas. Retrieved 2008-08-25.